A doctor defends scientific research against the potentially fatal misperceptions of the anti-vaccine movement. At least eight scientific studies have shown that there is no link between vaccines and autism, but thousands of Americans continue to believe that the tiny quantities of ethylmercury in the vaccine preservative thimerosal cause autism. (Thimerosal was removed from childhood vaccines by 2001, and autism rates have not declined.) Parents skeptical of the effects of vaccines have subjected their children to expensive, sometimes dangerous quack cleansing remedies including laser therapy, sonar depuration, special diets and chelation therapy, in which a child is injected with chemicals that bind to mercury. Chelation therapy is known to have killed one child, 5-year-old Abubakar Tariq Nadama. In Autism’s False Prophets: Bad Science, Risky Medicine, and the Search for a Cure (Columbia, $24.95), Paul Offit, chief of infectious diseases and the director of the Vaccine Education Center at the Children’s Hospital of Philadelphia, explains how the anti-vaccine movement became powerful enough to drown out the real science behind autism research. There are misperceptions about autism and its causes, about whether or not vaccines cause autism. Those misperceptions have done a tremendous amount of harm. Some children have not gotten vaccines that can potentially save their lives. It’s caused children to be subjected to harmful and dangerous therapies. It’s also diverted resources from studying more promising leads. That study done by the Centers for Disease Control [CDC] published in The New England Journal of Medicine in 2007, it was a $5.2 million study, and the seventh study to show that thimerosal doesn’t cause autism. When is it enough? The Omnibus Autism Proceeding, in which a federal claims court is hearing arguments about vaccines and autism, hasn’t yet been ruled on. Do you have a sense of how the case will turn out? There is no predicting lawyers. Although they are judges, they’re lawyers without an expertise in medicine, science, toxicology, vaccinology, so you could reasonably ask: is society best served when medical decisions are left in the hands of judges and juries? There’s already been a review by the Institute of Medicine and they concluded that neither MMR [the Measles-Mumps-Rubella combined vaccine] or thimerosal cause autism. Why isn’t that the ruling? Eventually, vaccine-autism cases could wind up in front of a jury. Can juries understand science enough to make a reasoned decision in court? No! To be clear, no! Juries have been terrible at sorting out scientific and medical evidence. I don’t think they should be charged with the task. Silicon breast implants are one example, where science clearly exonerated them as the cause of connective tissue diseases, and the juries didn’t get it right. And look at Bendectin. There were twenty-seven studies that found that it did not cause birth defects, and it was taken off the market. Jurors get it wrong all the time. The anti-vaccine movement seems to believe in a fairly vast conspiracy. You have to believe that scientists and physicians, in league with pharmaceutical companies and public health officials, both in this country and the world, have been hiding and misrepresenting data for decades. But anti-vaccine people have been around for centuries, really from the birth of the first vaccine, the smallpox vaccine. That’s not surprising. 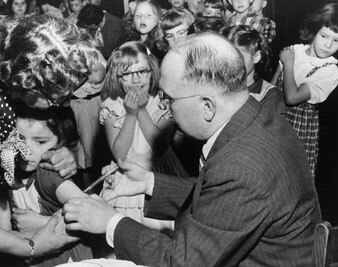 What’s different now as compared to even fifty years ago, when the Cutter incident [in which more than 100,000 children were inadvertently injected with live polio] occurred, is that the media is phenomenally irresponsible. The really good health reporter is hard to find these days. CNN, the New York Times, CBS Evening News are perfectly willing to put out information that is just dead wrong. That’s new. The Internet, obviously, is new, and there’s just this vast unscreened source of information. And it’s also a cynical, litigious time, so any association with money is evil. I get this all the time, because I’m the co-holder of a patent. People say that I’m just paid to say what I say, which isn’t true at all. How can people’s trust in science be restored? In many ways you’re asking to change the culture. The culture is one of believing that scientific evidence is simply another opinion in a sea of opinions. Science is just one way of looking at things, which is true–except with scientific questions, science is the only way to answer them. We’re not trying to answer how many angels can dance on the head of a pin. You’re asking for people to be more scientifically literate. In the past I don’t think people understood the science any better, but they were willing to believe and be reassured by science. Now they’re not. Science gets sorted through the prism of the media and the culture. How have these false charges against vaccines affected immunization rates? Immunization rates are stable, in the high 80, low 90 percent. What’s changed is those who aren’t getting vaccinated–not to completely not get vaccinated, which is less than 1 percent of parents. But as many as 20 percent are choosing to delay, or separate, or phase out vaccines. Look at The Vaccine Book by Dr. Robert Sears, where he has his own schedule: Dr. Bob’s Alternative Vaccine Schedule. You have the CDC and the American Academy of Pediatricians, and then you have Dr. Bob. When you delay vaccines, you increase the period of time during which you’re susceptible to vaccine-preventable diseases. That measles outbreak a few months ago that was in about fifteen states and 130 children–what’s worrisome is not that it started, because measles constantly comes into this country from other countries, including Western Europe. What’s worrisome is the cycles of transmission, how many times it goes from person to person. In one community there were twelve cycles, which means there’s no herd immunity. It’s the biggest outbreak in twelve years, because parents have chosen not to give the MMR vaccine. There will be measles deaths if this sort of thing continues. Measles is a killer. When Jenny McCarthy was on Larry King Live, she held up this poster that had the fourteen vaccines children get by 2 years of age. And she said, There’s too many. There’s just too many. And she was asked, Well, which one [disease] do you want to get? And she said measles. That’s the wrong answer. I’d have picked rotavirus. Measles is a killer. It’s a testament to the success of vaccination programs that this woman in her late 30s has no appreciation of the disease. You write about how pharmaceutical companies have lost all standing in the public’s mind. How can that be regained? Should it? We can vilify pharmaceutical companies all we want, but they’re the only ones that have the resources and expertise to make the drugs we need. Both Obama’s and McCain’s ads vilify pharmaceutical companies. McCain says, I’m a maverick. I’m taking on Big Pharma. Does no one stand up for pharmaceutical companies? It used to be conservatives. Now everyone throws them under the bus. Pharmaceutical products account for 7 percent of all healthcare expenditures. If you replaced them with generics, it goes down to 4 percent. They’re not the problem. How have you prepared for the book’s publication? We put a new security system into our house. I just met with the security people here at Children’s Hospital of Philadelphia. I get my usual hate mail, and recently I’ve been getting a lot of voicemail, which is always worse, to hear the person’s voice. My hope for the book is that people will be convinced by the science, and they won’t be afraid, and will devote their energies to driving the good science that will make a difference. The whole autism-vaccine story is so off the point about autism. I shouldn’t be in this discussion, because vaccines don’t have anything to do with autism.